Malcom Hughes gave a very informative talk for our club night and I managed to gleen 10 pages of notes from the talk and here is a summary of the main points that were discussed regarding maples. 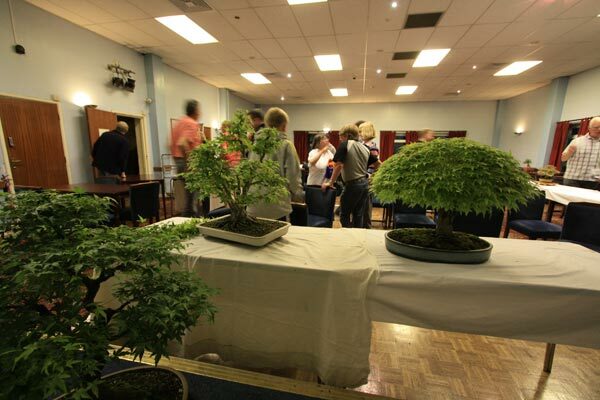 Just a quick note at the start, the majority of comments, techniques and views expressed were in connection with mature, well established bonsai maples as opposed to training material. Before you start to think of summer maintenance, you should first reflect on the previous month’s exposure of your maples as to how they may have been affected by a harsh winter for example or a late spring as this will impact upon how much pruning work you may carry out in the summer. 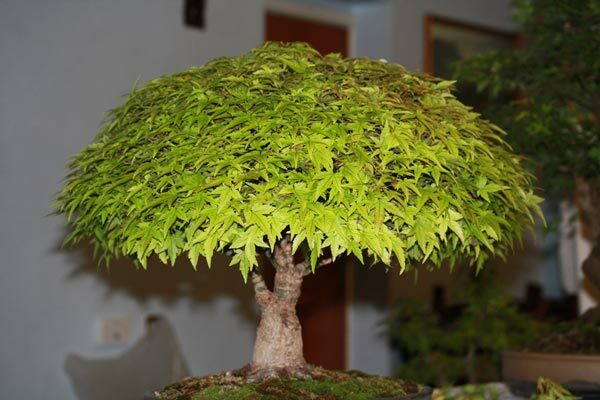 This particular winter many Trident bonsai owners have experienced issues with die back and death of this species of maple and they appear to be more sensitive to cold winters compared to other maple species. This sets the tone for the discussion, as there is an extensive range of maples which come in many varieties and many more grafted maples and some are more robust and hardy than others. 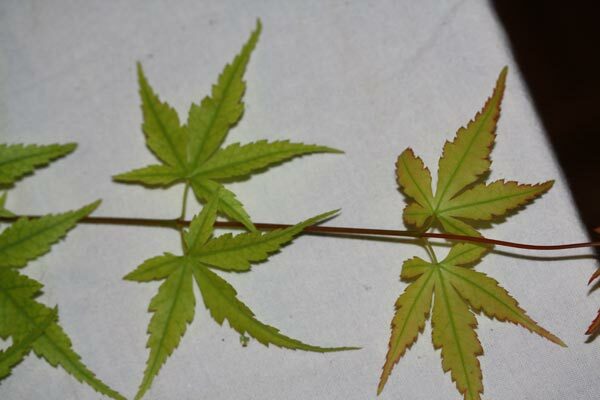 Take the Kiyohime for example; this is the first into leaf once the buds form in around January and by late February they are in leaf if kept undercover during the winter, it is also a green leafed variety of maple. Malcolm felt that this tree was best when viewed from below due to the broom style showing off the branch structure to its best advantage however this is not possible when exhibiting the tree easily. This variety is weakest at the apex, and you often get die back in the crown as a result of water stress as this is a water demanding tree aka a heavy drinker. It however is vigorous and you can re-grow an apex within 2 -3 years if it has wilted and died. In terms of watering, tend to water the soil as opposed to the canopy to ensure water reaches the roots. Malcolm brought up an interesting point with regard to dispelling a myth in that he is content that watering the leaves of maples on hot days will not cause them to burn due to refraction and that the water will dry naturally with no ill effect to the leaves. He did stress concern though that they are subject to wind burn and this does need to be considered. The Seigan maple was next, Malcolm owns two of this variety and feels that it is an awkward tree as it starts to flush with bright red leaves in around the end of April, early May but these become mottled then go black and curl up and a second flush of green leaves appear. It is not until early June that finally the tree is in full green leaf and remains in leaf until around late November and does not have an autumn colour but just drops its green leaves. The majority of maples beyond the above are somewhere in between the Kiyohime and Seigan in that they come into leaf in late spring and are renowned for their autumn colour. 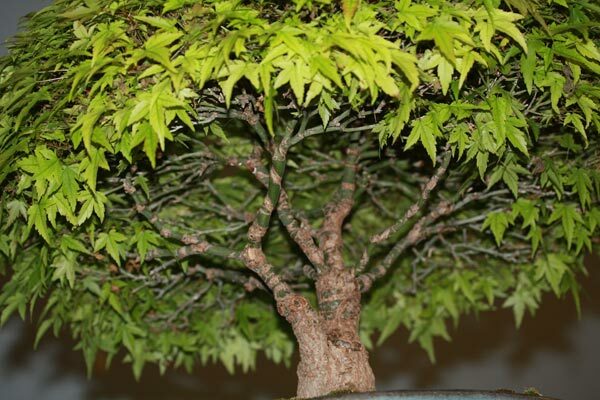 One of the most common maples used in bonsai is the Acer palmatum (Japanese Maple) and these have finer leaves and are more vulnerable to scorched leaves. One of the example maples that malcolm had brought in to show us had six trunks and they come out into autumn colour at different times and in different colours despite all being the same variety. This species of maple suffers from cold conditions due to the nature of its root systems and the tree leafs up early. The leaves are prone to scorching in spring as they are not fully matured and so the trees should be kept in semi shade until the leaves have hardened off. Not everyone but maples owners tend to keep their maples in greenhouses, poly tunnels or under cover over winter to provide a level of frost protection which can help the more sensitive less hardy trees come through a winter better. With regard to frost, try to protect your maples, and the frost is not sufficient moisture alone when trees thaw out, they still need watering. Another element to ensuring your maples get through winter is to ensure that during the run up to winter that your feeding regime is adapted to provide the trees with nutrients over this period as it will then sustain them into the spring. So this was another myth that Malcolm was keen to expel was that bonsai trees do not need water when they are dormant, they do albeit less water right through the dormant season. He also suggested watching your maples closely around February to March time when the buds start to swell and to increase your watering in line with this process as it will help the trees come into leaf and aids with bud development. So in line with the above, feeding is important to maples, and in around April, once the leaves have formed, start to feed a high nitrogen feed as this is vital for growth and vigour. From around May through to August move over to a more balanced feeding regime higher in phostrogen for example Tomerite. Then around September move onto a high potassium feed like blood and fish bone as this helps the roots. Leaf scorch can occur though and is a good indicator if you are over feeding your trees as the leaves burn so it is better to feed little and often and always read the label and give less not more in terms of strength. Malcolm talked around a Japanese Maple which he had pruned throughout and the re-growth was apical dominant and that in general re-growth on maples is prolific if left. However this is a good thing if you want to develop a branch. Maples have opposite bud formation and this tree has equidistant bud spacing and equal intermodal growth generally but this is not always the case and ideally you want maples with short intermodal growth. When you prune you must allow for die back at pruning points so ensure to leave a stub when pruning otherwise you may lose the buds with die back. The apical growth is the most vigorous and this is where you get greater branch thickness. There are two ways to leaf prune maples and they are determined by the type of spring to early summer conditions and also the health of your maples. The first method can be carried out in June and this is to completely defoliate the tree by removing all the leaves. To do this cut off the leaves but leave the stalk and petiole as the new buds form at the base of the stalks and are dormant and waiting to flush. Do not feed once the leaves are removed but continue to water. The reason behind this approach is the give the tree an artificial winter, it has already lost its leaves once in autumn and this is a second opportunity to create a new flush of leaves which happens around 5-6 weeks from when you carried out the defoliation. The new leaves will be fresh, smaller and brighter in colour and provide you with a new set of even sized leaves. This may be a requirement if you are looking to show the tree or are preparing it for an exhibition. 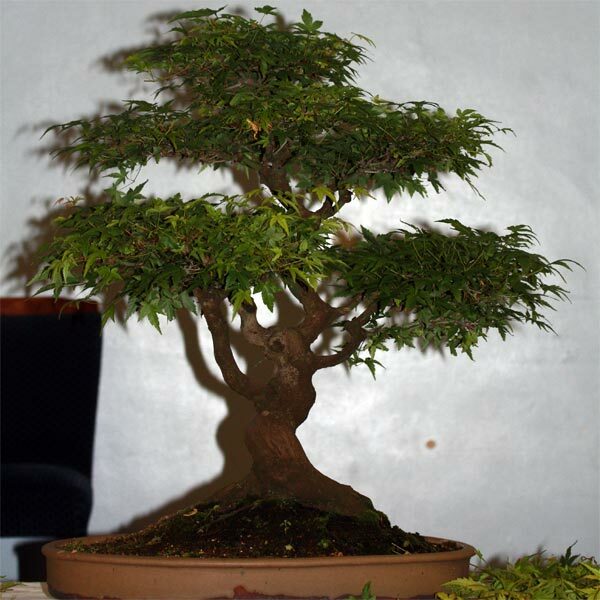 However, a note of caution, this should only be a one off exercise and not an annual activity and only used on mature, well developed bonsai trees as it is a very stressful process for the tree. If the tree is very healthy, you could do two years in succession but Malcolm would not advise this as a rule due to it affecting potentially the health and physiology of the tree. The latest time to remove all the leaves would be mid July but dependant on the species or variety and ideally pre-July. The second option is a partial defoliation, which means that the leaves are then in variance with each other for a period of time while the partial defoliation process occurs and is repeated once re-growth forms. 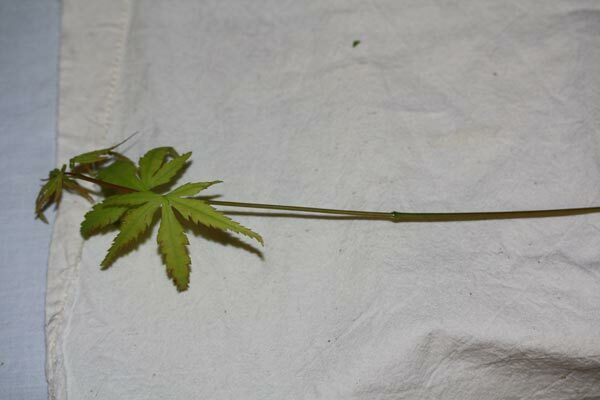 You selectively remove the larger leaves leaving the stalks again and leaving the smaller leaves. This can be done around July and September and once the larger leaves have been removed, smaller leaves will form. This is less stressful than a full defoliation and may be a slower process but better for the tree. Do not make the mistake as demonstrated in the image above and remove all the leaves and only leave on the two leaves on the apex, this is not the correct method of defoliation. Leaf stalks should be kept and only the leaf cut of in either full or partial defoliation. Bud distribution is important on maples and once the buds appear on branches and out of trunks on younger maples you can start to select which buds to keep and which ones to remove. Mature trees usually have buds on branches and they are less common on trunks. Young trees are prone to bud proliferation and this aids with selecting the best buds to aid with ramification. Unwanted buds can be pinched out with fingers and the aim with ramification is to create a thinner delicate branching structure for the tree. Buds at the apex can aid with branch elongation and buds on branches and trunks can be grown on to fill gaps in the canopy. Generally though you would not want clusters of buds, so remove all upward and downward pointing buds, keep ones at branch tips if needed and keep horizontal ones but thin them out to select one or two to develop. You can otherwise remove them all if they are not needed. 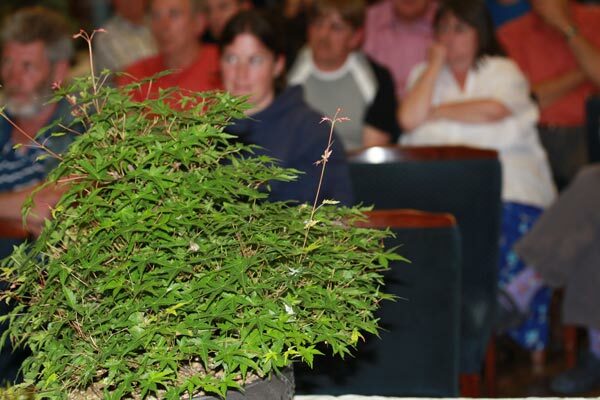 If you have a mature maple where the higher more delicate branches are becoming too thick a bud below the branch is useful as this can be grown on and form a replacement branch when the thick branch has been removed. 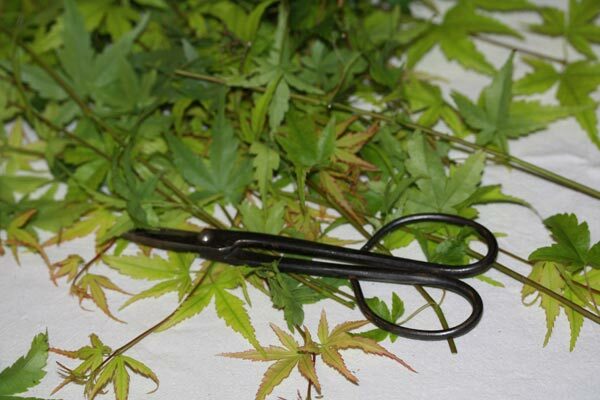 Backward or inward facing buds can be removed if unwanted however; they can be useful as they can be used as grafts internally via thread grafting. Select an inward facing bud and allow the bud to grow and the shoot to extend. Once the shoot is long enough, drill a hole from the side of the trunk where you want a new branch to be formed. Drill the hole using a hand drill (as this creates less friction). Thread the shoot though the hole trying to retain the leaves if possible or remove the end two but keep the stalks. Seal each of the holes around the threaded shoot with cut paste. The timing for this technique is from spring to early summer when the trees are at their most vigorous. If you have no suitable buds on the tree you need a new branch on, you can use another tree of the same species and use the same method. 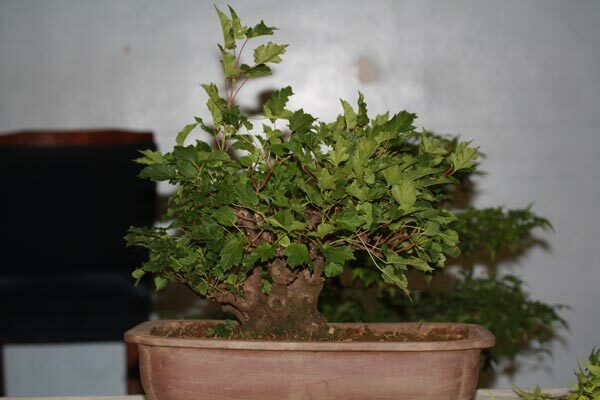 Maples have a vigorous root system and often maple bonsai owners re-pot annually as this is a safe basis of a routine. They also use glazed pots as this is the norm for maples in general and the balance works well. However, can you let re-potting lapse? 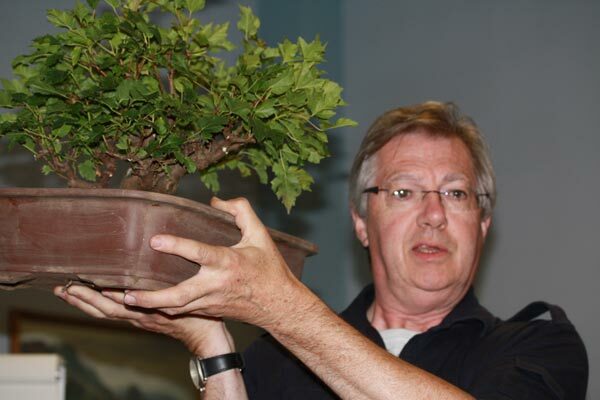 With established mature old bonsai maples, Malcolm felt you can and re-pot them on alternate years. Younger trees are prone to root girdling so they would need re-potting annually though. A note of caution, bonsai trees do not follow the books and the books are not always leading you to the correct answer as if they are written about bonsai trees in Japan and America, their climates are different to ours and this will then affect the timings they suggest for re-potting or other activities. So if you read bonsai books apply the methods but ensure that you do this in line with the correct time zone for your maples. If in doubt, take the tree out of the pot and examine the roots and determine if the tree needs re-potting regardless of what the books tell you, as it is more important what the tree is telling you. The common method is to remove the tree from its pot and to cut of a portion of the fibrous roots around the entire root plate or root mat. There are many techniques and Malcolm had seen a method in Japan where they took out wedges of the root plate on alternate years but they have a more humid climate that allows the trees to cope with this approach. If the tree is being pushed out the pot, this is then the time to reduce the thickness of the root plate by pruning off a portion of the underside of the roots so it sits in the pot, so prune around ½ inch off but avoid this is the tree is still being formed. NB: It is important when re-potting to examine the whole of the root system and not to just prune around the edges, aeration of the roots is vital to the long term survival and health of the tree. The extent to which you remove all the old soil is dependent on what you find once you remove the tree from its pot. With maples, the soil mix should be very open, free draining or with very good drainage. Malcolm uses around 50% grit and 50% akadama and occasionally adds some peat free compost to the mix. Terry Adams on the other hand uses pure akadama but finds in cold spells or with frosts that it swells in the frost but it is easier to see if the trees are dry when they are in pure akadama. If you use akadama though you must remember to sieve it to remove the dusts and sort out the particle sizes into small (fine) for top dressing, medium for the main growing medium of the bonsai tree and large particles at the base of the pot to provide a drainage layer. This works well with maples, cut a section of bark (ring bark the tree) off from around the trunk below the point where you want to take an air layer. Apply root hormone powder to the upper exposed cambium as this is where the roots will form. Wrap the exposed sapwood in sphagnum moss and cover in clear plastic and then cover again in black plastic. The clear plastic allows you to see when the roots start to form, while the black plastic aids with root development. If is not necessary but you can apply a tourniquet to the trunk but maples get wire damaged easily so it does not aid the process. Once the roots are formed in the air layer section, cut off the section and take care as the new roots are brittle. Leave the moss attached to the roots and for better root spread place the air layered section on a plate to develop further. With maples you should check your wiring monthly as maples bark marks easily and they grow so rapidly that the wire cuts in. Only wire when the leaves fall and remove the wire once the leaves form. 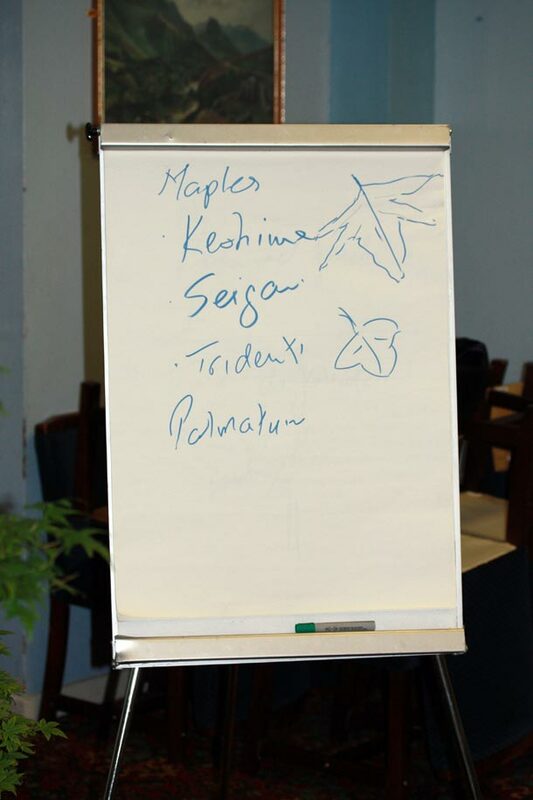 Many members brought in bonsai maple trees for Malcolm to review, but we ran out of time unfortunately although he did manage to comment on two, and one of these was an Amur Maple owned by TA which was in the process of being developed. It is a very vigorous species with long intermodal growth and is currently in a large pot to allow it to grow on. 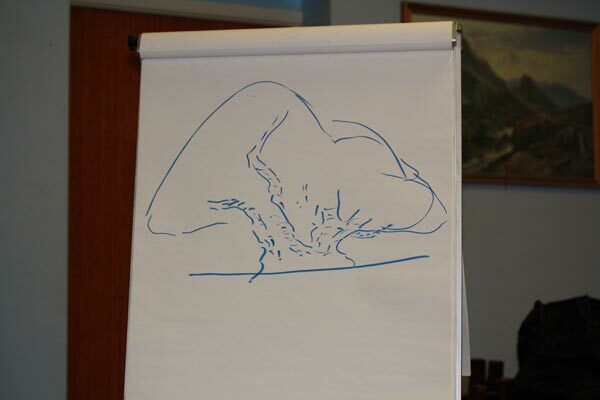 Malcolm drew an idea of what the tree could be developed into and suggested that the tree was perhaps potted on into a wooden box to allow it to grow further. This would then provide an opportunity to fill in the gaps in the centre of the crown and that TA could also undercut the callous wood around the central large wound to stimulate more callous growth with the rolling in further of the top of the wound. 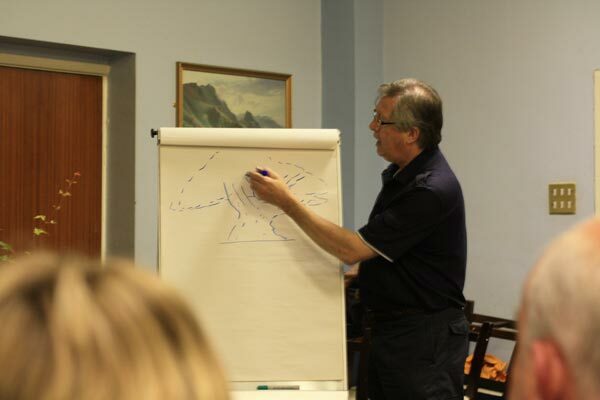 The final tree discussed was a power maple owned by PBs and Malcolm recommended that he thinned out the foliage so you could see the trunk lines and natural flow of the trunk and branch lines to make the most of the trees natural shape. He did not feel that a second apex would be beneficial for this tree though but thought it had great potential. Posted July 12, 2011 by AW & filed under Club Meetings.